An evil man, Mick Philpott, was jailed this week for killing six of his children by setting fire to his house. His actions were, it seems, a grotesque attempt to frame his former lover for arson. An extraordinary and unique story – hardly a parable for the decline of a nation. In truth, it’s impossible to rationalise the logic of someone who pours petrol over their home, consigns six children to death, and then according to evidence presented in court “engaged in “horseplay” when he went to view his children’s bodies”. But one thing is certain, the man responsible for this act of barbarism is Mick Philpott, not William Beveridge. The Mail’s Philpott front page is the latest move in a cynical campaign by the Conservative right wing and their media supporters to smear the poor and disadvantaged. At a time when thousands of families are struggling to make ends meet, the right is very deliberately attacking the postwar consensus that the state should help when hard times strike. At the same time, the coalition’s cabinet of millionaires is cutting benefits and imposing a bedroom tax, while cutting their own tax burden. All that said, it’s entirely reasonable for the media and politicians to ask serious questions about how the welfare state operates. (In the same way that we should be able to talk about immigration openly and sensibly.) You don’t need to be a right winger to ask whether someone like Philpott should be paid over £54,000 a year by the state to father 17 children. As Dan Hodges said in his blog, the left can be just as cynical in exploiting the vulnerable for their own political purposes. 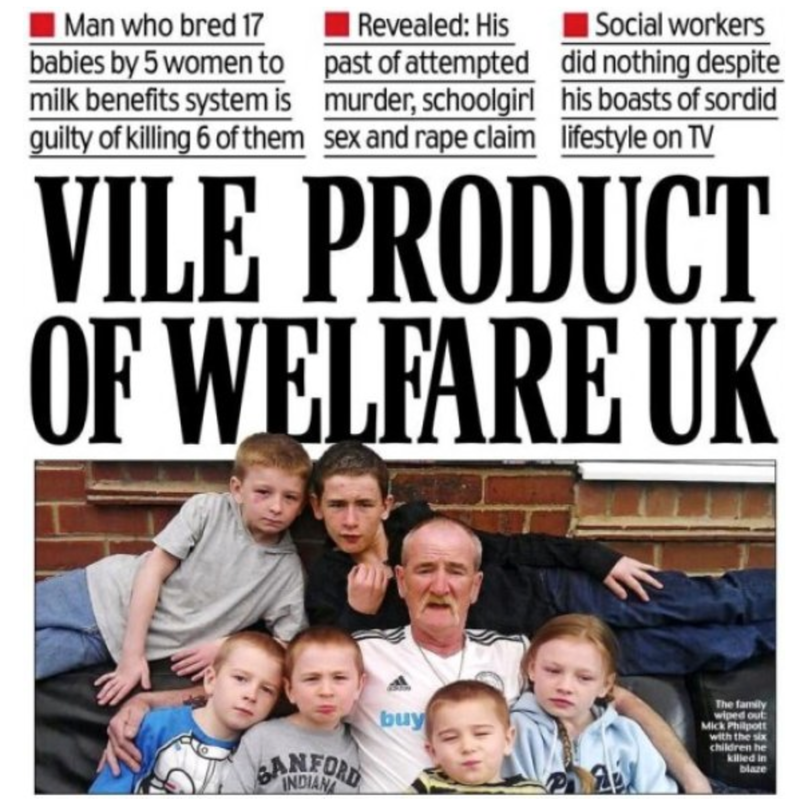 But nothing quite matches the fact that the memory of six tragic children has been used by a newspaper that cares nothing about them, but everything about its hatred for Britain’s welfare state. It’s not just papers like the Mail who exploited the Philpott story. Before the Derby killings, Philpott appeared on so-called reality television shows. He became a minor celebrity. This violent and evil man became a figure of entertainment. One final word. The Daily Mail would have us belief that benefits and allowances are easy to come by. But our family’s experience shows that the state can be callous. My mother is partially sighted. She is totally dependent on my father for support. They’re both in their eighties. They were totally entitled to attendance allowance. Yet she was turned down. The form was designed to ensure people’s applications failed, no matter how worthy their claim. Mum only got the money she deserved because her wonderful MP, Labour’s Alun Michael, took up her cause. (Alun is now Police & Crime Commissioner for South Wales.) So much for the welfare state. The state should be there for people when they need help. It often isn’t. But Britain’s millionaire cabinet and the Daily Mail’s calculating editor in chief Paul Dacre live in a different world. They will never comfort the afflicted and afflict the comfortable, as the press is meant to. No wonder they’ve formed a cynical alliance to prevent regulation of the press. How telling that they’re more concerned to punish the poor than condemn the bankers, like HBOS bosses Crosby, Hornby and Stevenson, who trousered millions while leaving the state to spend unimaginable billions clearing up their mess. Let us mourn six tragic children without using them for political purposes. This entry was posted in Media, Politics & current affairs and tagged Daily Mail, Mick Philpott, welfare state by Rob Skinner. Bookmark the permalink.